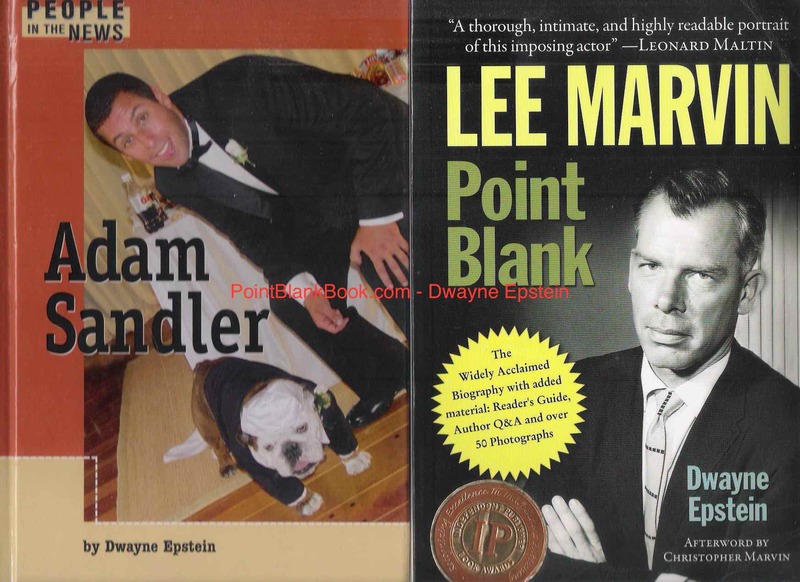 People In The News: Adam Sandler (2004) published by Lucent Books, and then Lee Marvin Point Blank in paperback format as published by Schaffner Press in 2014. A possible connection between Sandler and Lee Marvin is of course anything but obvious. However, with yours truly at the helm of this blog, there becomes one. To put it another way, there would never have been 2013’s Lee Marvin Point Blank had there not been 2004’s People in the News: Adam Sandler. Hardly clarifies, now does it? Heh, heh. I shall elaborate. I came in contact with the good folks at Lucent (alternately known as Gale, Greenhaven and god knows what all) by good fortune and discovered their People in the News series. They promptly offered me either George Bush Jr, Eminem or Adam Sandler. The choice became obvious. Thank god Sandler made Punch-Drunk Love or I never would have survived! They also informed me of certain writing requirements for each title in the series. Chief among them was to not only write each chapter chronologically (duh! ), but more importantly, emphasize an important theme within each chapter. THAT dear reader proved to be the best lesson and ongoing exercise I ever got in biographical research and writing. Readers of Lee Marvin Point Blank may hopefully see the chapter themes as well as the overall theme of Marvin’s life and work. 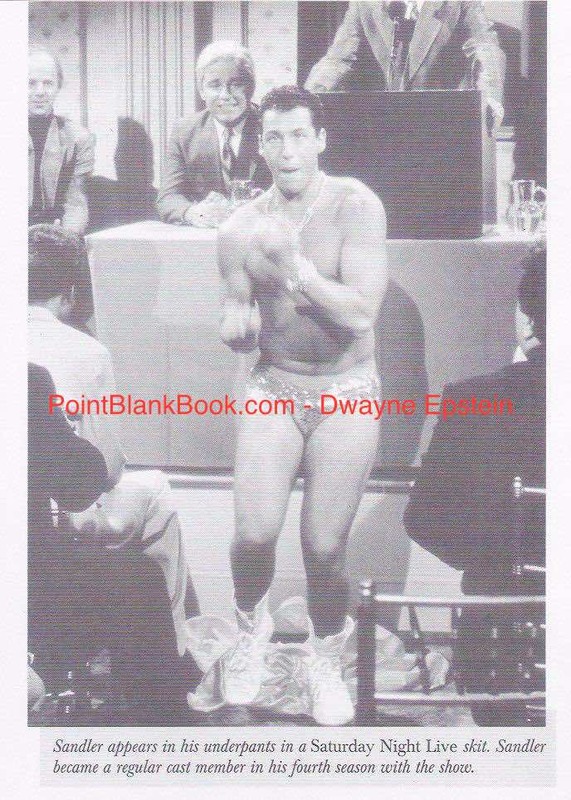 It was a direct result of my writing about Sandler and later other prominent contemporary figures. I actually wish those books were still being published but alas, the likes of Wikipedia’s popularity put an end to the series. Ahh, well. Such is life. I came up with the chapter titles based on those themes I came up with in researching Sandler’s life and work, as shown below…. 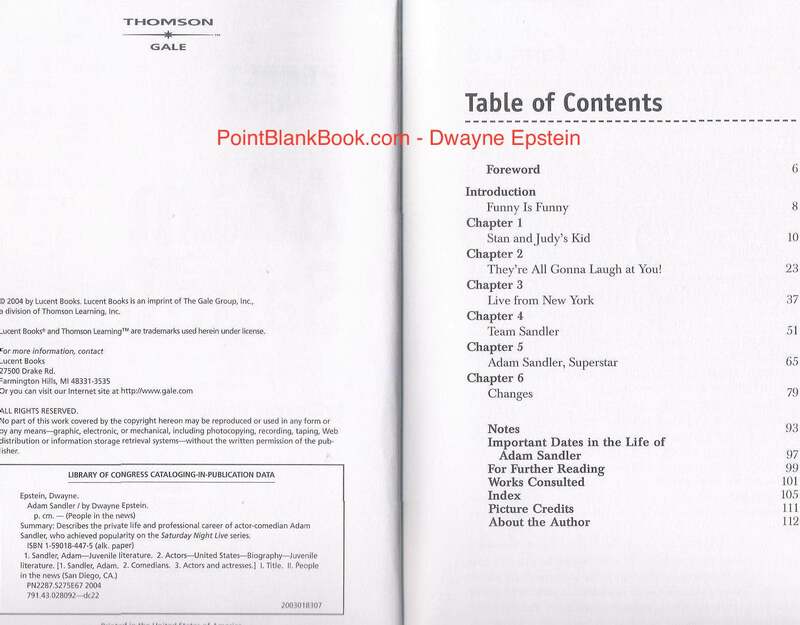 Copyright page and table of contents for Adam Sandler People in the News. Introduction to Adam Sandler People in the News and the theme therein. Cool, huh? I guess discovering the theme of Sandler’s work, no matter how corny or distasteful it may be to some, proved successful, after all. Yeah, Sandler’s going to be around for a while, Hopefully, I will, too. Here’s proof that I had nothing to do with the choice of photos used or the captions that were written. I would not have chosen this photo and if I did, I surely would have mentioned that looks on Dana Carvey and especially Phil Hartman’s faces. On the face of it, there may not seem to be any connection at all between Hillary Clinton and Lee Marvin, but for me there certainly is. Although the seemingly endless wait to get a publisher interested in Lee Marvin Point Blank had me close to abandoning it several times, the ultimate timing of it could not have been better. Why is that? Because in the interim, I vastly improved my writing skills via the the occasional young adult biography I wrote for a company called Lucent Books. Without the constant flexing of those writing muscles, and the valuable lessons learned in the process, I would never have been up to the heavy lifting that got Lee Marvin Point Blank to see the light of day. I came in contact with Lucent initially via a friend who wrote for them. Several series appealed to me but the one that caught my eye the most was People in the News. At the time, I was offered several possible titles and the first one I took was Adam Sandler. Why Sandler? Because the other choices was George W. Bush or Eminem. I was extremely reticent at first as other than SNL, there was nothing about Sandler I cared to write about. Luckily, I watched Punch Drunk Love and my admiration for that film and his performance got me through the project. It also taught me how to find an angle on a subject I may not entirely enthusiastic about. Other titles followed in quick succession that I found much more palatable: Will Ferrell, Hilary Swank, Denzel Washington, Lawmen of the West for the History Makers series (Hey, I was branching out!) and also the first and second installments on Hillary Clinton. It was these two titles that drove the lessons home and ultimately made Lee Marvin Point Blank a better book. How, you may ask? Well, to start with, the publisher’s requirements for all the titles included a specific theme for each chapter in the subject’s life. 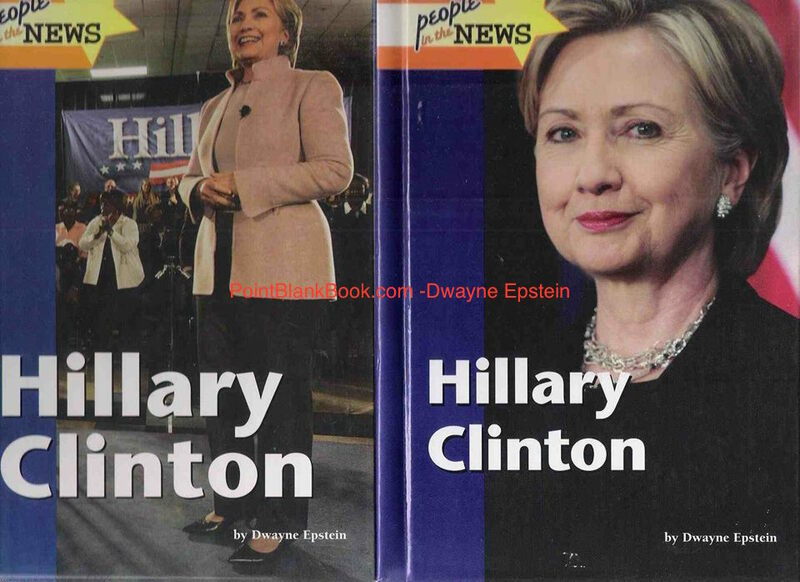 The covers of my Hillary Clinton young adult biographies, the 1st in 2008 (left) and the revised version in 2010. Some were easier to discover than others, although an additional title on first female Speaker of the House, Nancy Pelosi, proved especially daunting in trying to break down the complex rules and inner workings of Congress. That aside, the private life and public career of Hillary Clinton was equally daunting, yet, also useful to Lee Marvin…. 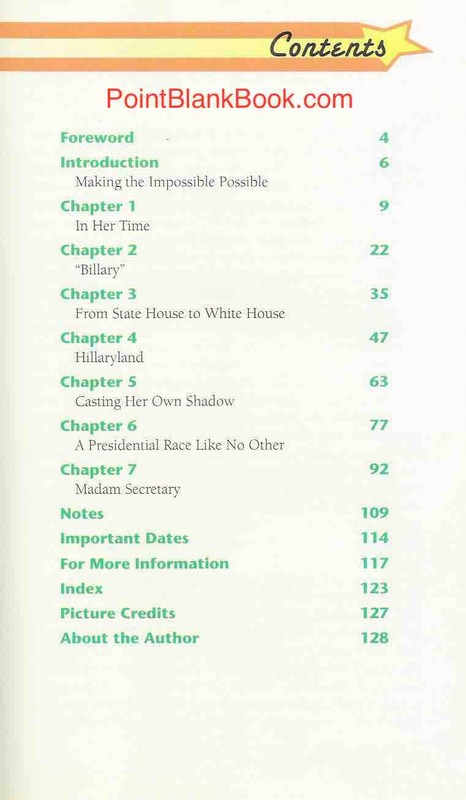 The table of contents for the original and later revised version of Hillary Clinton. Readers of Lee Marvin Point Blank might notice the use of both familiar quotes as well as timely phrases in the chapter titles. Not that I didn’t already know how to do that but my ability for searching out and finding the RIGHT phrase had certainly improved. Then there was the introduction. By the time I got to Hillary, I discovered that instead of writing the intro first, and then having to go back and constantly redraft it based on the book’s content, I made the rule to myself to ALWAYS write the intro last. Introduction to People in the News: Hillary Clinton. End of intro and first page of first chapter. It may also be obvious that in writing about a subject’s early life, the influence of one’s parents is almost impossible to overemphasize. However, keeping in mind the reader’s interest level should never be lost or wander to far afield from the subject itself, creating a tapestry that interweaves both the parents legacy and the subject’s thoughts and lessons from the parents, was something I found works best….. Text and photos illustrating the impact Hillary Clinton’s parents had on their daughter’s life. By the way, I had no control over the pictures that were used but for the most part, I was very pleased with what was utilized. Oh, and another requirement was to include 2 sidebars for each chapter. 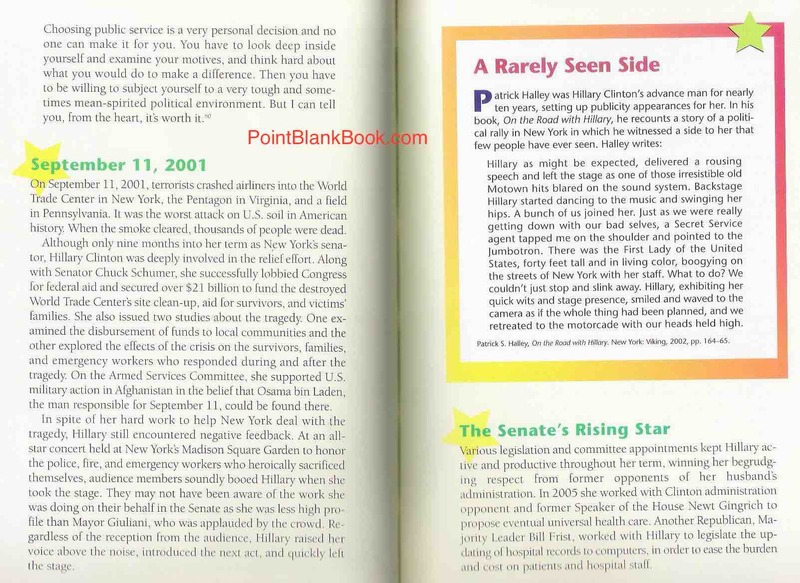 Often it was simply a glossary of terms used in the text but for Hillary, I was able to branch out and include specific anecdotes that didn’t fit the text but were too good not to include…. Two sidebars were required for each chapter and above is one of my personal favorites. I should also note that in researching the life of Hillary Clinton, there was an awful lot of useless and baseless rumors passed off as fact that got to be very frustrating. The advent of social media has made it worse but when I was writing the book, I had to constantly come up against obvious conjecture passed on as fact. I drew the line when I read one author’s bio of Hillary who claimed you could see the devil himself when you look into Hillary’s eyes (!). Yet another permanent lesson was used in conjunction with Lee Marvin. Never, ever mention a rumor, even if it’s an attempt to debunk it. Gives it unnecessary creedence. Anybody read About Captain Kangaroo in my book? I didn’t think so. 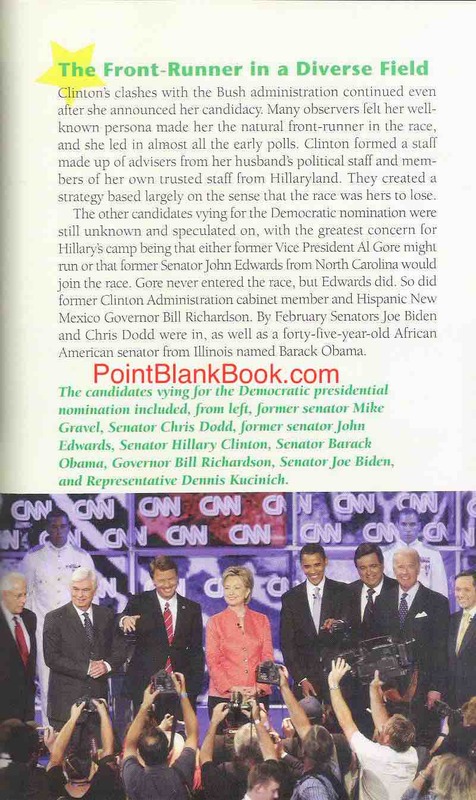 Covering the 2008 Democratic Presidential Primaries in the revised Hillary biography. 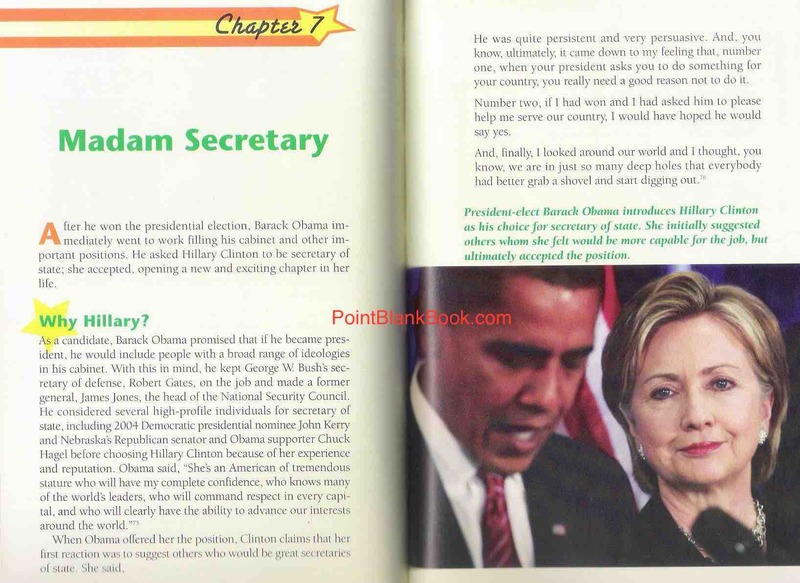 Because Hillary Clinton was in the beginning of her tenure as Secretary of State at the time the book came out, it became the concluding chapter of the book. Luckily, I did not have to deal with Benghazi, private e-mail servers, Wikileaks, and an entire host of other frustrating subjects….. 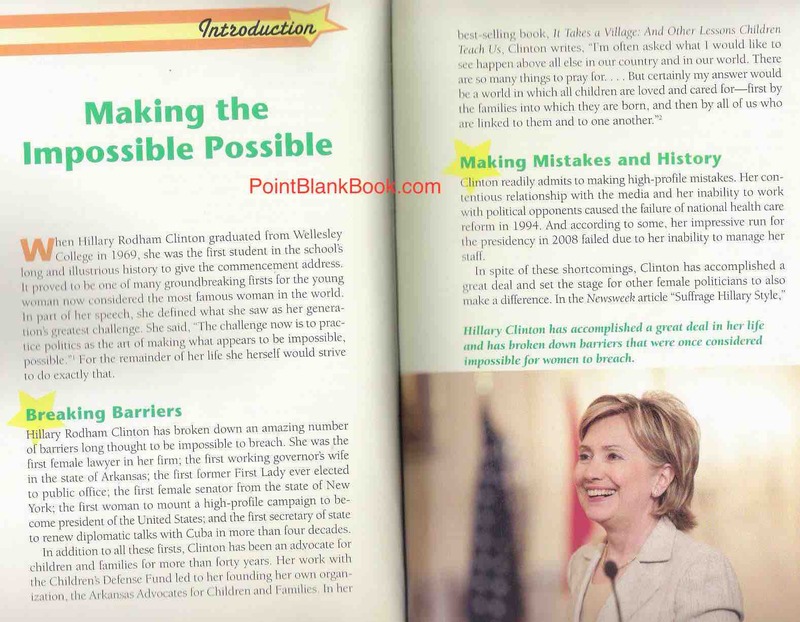 Covering the period of Hillary Clinton’s life at the time of the book’s release. That’s not to infer that unpleasant subjects were not dealt with. There was still the financial records of the Rose Law Firm, the Whitewater scandal, Vince Foster’s suicide, Monica Lewinsky, Bill Clinton’s impeachment, you name it and I dealt with it. It’s just that what took place since the book came out was far too ridiculous, in my opinion, to have to contemplate. If you’ve gotten the impression that researching Hillary Clinton has made me a fan, you would be right. For me, I personally have to make some sort of connection with who I’m writing about, even if aspects of the subject is unpleasant. I did with Hillary and came out the other end of that project a better writer and renewed respect for the subject. Sadly, things like Brietbart, the Drudge Report and other ultra-right wing websites and/or blogs have blurred the lines between fact and fiction. Luckily for me, another requirement of the publisher was to only use existing information that could be noted extensively in the book’s several bibliographies. No interviews were allowed. It ultimately allowed me to separate the wheat from the chaff, as it were, and make for a stronger story all the way around. The end result was that by the time my agent, the late, great Mike Hamilburg had interested publisher Tim Schaffner in my Lee Marvin bio, I was able to provide the goods he asked for with renewed confidence. Not only did I have almost 20 years of exclusive research and interviews under my belt, when Tim asked me if I was familiar with the requirements and skill to write a biography, I was able to provide evidence of my work in the field. Granted, it was in the genre of young adult, but when he read the samples I submitted, he sent me a contract to sign. 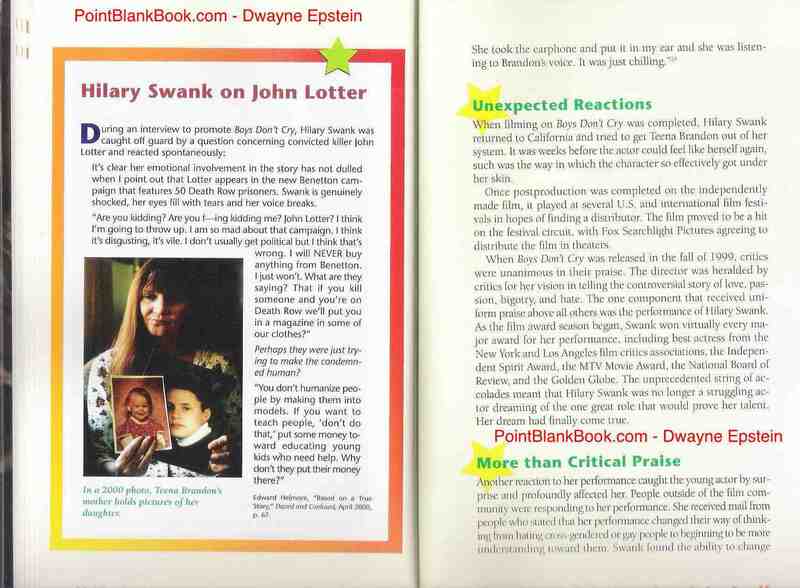 Basic research, theme development, enlightening anecdotes, and more, all in the service of two Hillary Clinton biographies helped Lee Marvin Point Blank to see the light of day….. and make the NY Times Best Seller list! Best of all worlds? With a little luck, she’ll be the next President of the United States and some folks might rediscover Lee Marvin ALL over again. One never knows what subject may arise when writing a biography, even a biography for young adut readers. 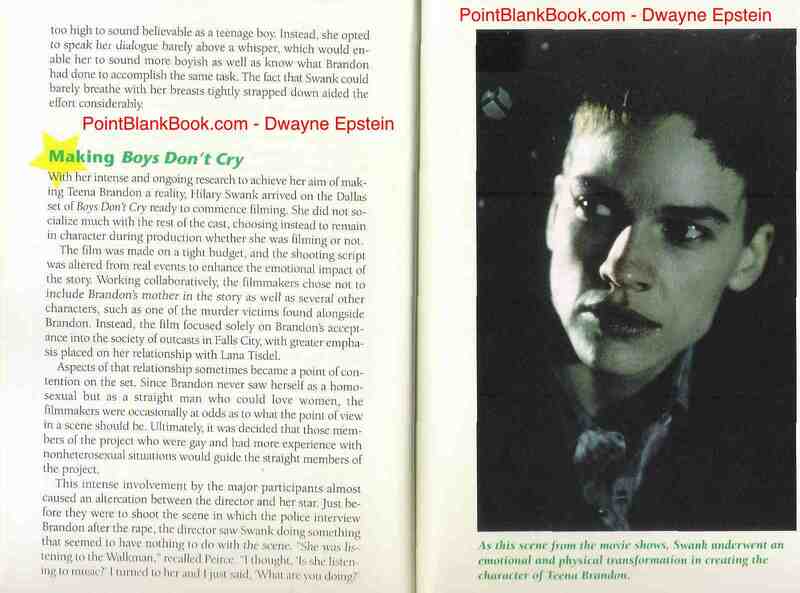 The recent controversy making national news over transgender issues, whether it be bathroom use or equal rights, reminded me of the time I wrote People in The News: Hilary Swank for Lucent Books back in 2007. When Swank made the film Boys Don’t Cry (2000), I was faced with the obvious controversy of the film’s subject matter. At the time, I was not sure how far to take it, how to write it in specifics, or even how casual the langauge should be, when considering I was writing for middle school and high school readers. My previous titles in the series, such as Adam Sandler and the first Hillary Clinton bio, was of course work, but nothing as controversial as the subject of Boys Don’t Cry. It was a challenge to say the least. The publisher had let me read some previous titles in the series, and I was quite taken aback by some of the frankness in the writing. Madonna’s overt sexuality on stage, Tim Allen’s drug bust, and other controversies were treated quite straighforward and had me realize young adult bios had changed considerably since I was kid. With no further requirements from the editor, I took a deep breath and went ahead and reseached and wrote it as straightforward as I thought possible. I’m glad I did. Years later, when working on Lee Marvin Point Blank, I was able to utilize the same techinque in dealing with the subject’s obvious PTSD when it came to my attention that he suffered from it. I’ve been called out by some for my armchair diagnosis, but reseach has shown it to be quite obvious that he suffered from it his entire adult life. So, when writing about the tragedy of the real Teena Brandon, how actress Hilary Swank won the role, prepared for it, and the effect it had on her personal life, a valuable writing lesson was learned. No need to dance around the subject. Straightforward always works best. When I submitted the manuscript, all of it was left intact with nary a word spoken about it from the publisher. And so, with transgender issues again very much in the news, I present below the way in which I dealt with it for young adults nearly ten years ago. Sad to think the issue itself is still having to be dealt with in 2016 but at least it’s being dealt with at all in this climate of fear, hatred and homophobia…. 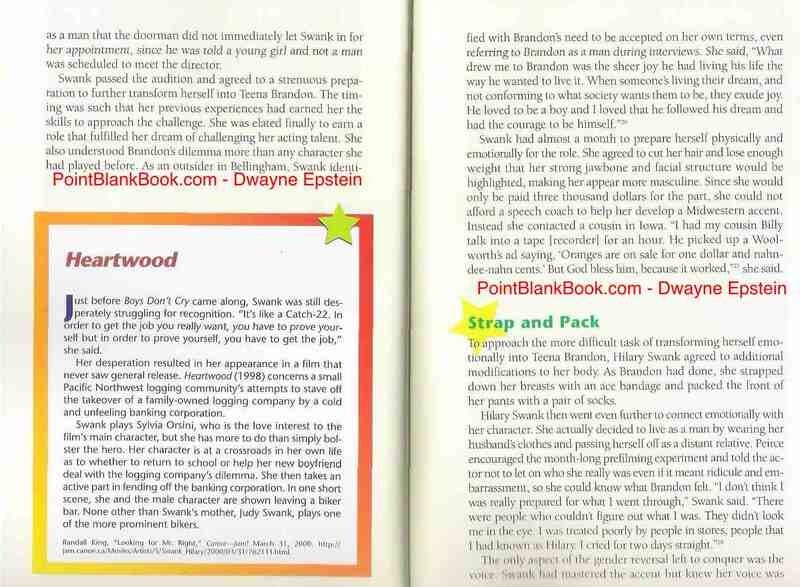 How I dealt with transgender issues for young adult readers, from the beginning. Hilary Swank rises to the challenge of playing Teena Brandon. Specifically written for possible transgender readers.